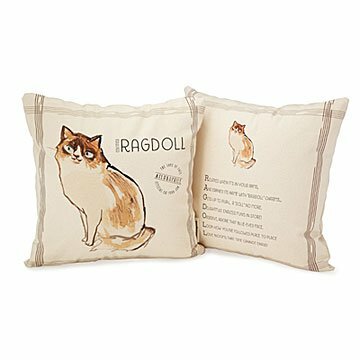 Unique from head to tail, this pillow features an acrostic poem celebrating your kitty's special traits. Your fur baby rules the family, and this decorative pillow poetically says you wouldn't have it any other way. Unique from head to tail, each design features a playful acrostic poem celebrating your kitty's special traits-from the Siamese's "loud and low—pitched song" to the "formal clothes" of the aptly named Tuxedo—and an illustration with real meow factor. It's stamped with an "Ailurophile" seal (aka "official cat purr-son"). Poems by Martin Geller. Illustration by Patricia Carlin. Made in Brooklyn, New York. Find out more about Martin Geller, the man behind our Cat Composition acrostics, on our blog. Click here to see our Cat Composition Mugs, Cat Composition Art, and Cat Composition Tote. Cover can be machine washed inside out on cold setting; hang dry.